Unlike most facilities, Montreal Laundromat ( Lavoir Victoria) has friendly staff who will do your complete laundry –wash and fold. If you’re there to do it yourself, the full time staff available in in both locations can advise and and assist you. The store is very customer friendly. Yes, you should be bringing in your own preferred soap, softeners and bleach, but if you are stuck they will sell you a cup. They have carts, washroom facilities, customer seating, bill changers and counters on which to fold your clothes. Montreal is lucky to have a friendly, helpful, long-serving laundromat family in our midst. With one of the largest (the most washers and dryers) location in the city, have had the same owner for 38 years, so there is a continuity and long-time understanding of the best machines and knowledge of how to get your items clean. The Patricia location in Montreal West has 6 different sizes of washers, from 10 lbs to 65 lbs. 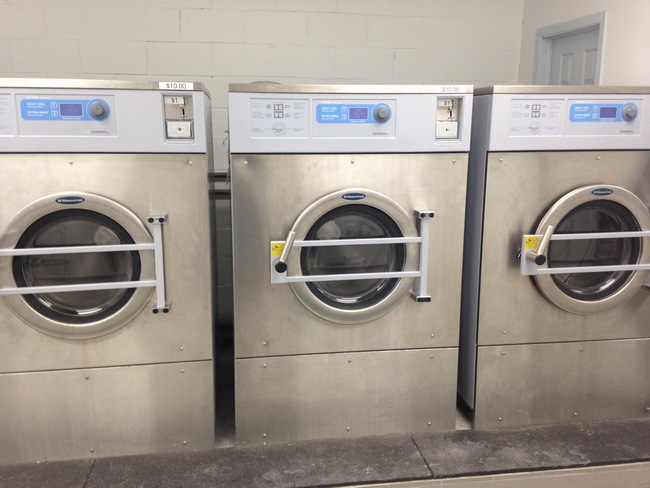 When you walk all the way to the back, you will find the 4 giant washers at the 65 lb capacity (and 4 giant dryers), so you can do big loads quickly and efficiently. Also, the less expensive machines with double capacity are at the Patricia location. Even if you have a washer and dryer at home, there are still times you might need this laundromat – for spring cleaning, putting winter clothes away, when the kids come back from camp, getting ready for big holidays or if your machine at home suddenly breaks down. They are the only laundromat in the city with 4 77 lb capacity dryers. Lavoir Patricia has Maytag top-load washers along with Wascomat front-load washers, which are considered some of the best in the world. A regular cycle in these professional machines comprises 2 washes and 3 rinses, which means five complete water changes to ensure the cleanest wash possible. These are available in 20 lb., 30 lb., 40 lb. and in the 55 lb. size which is great for giant loads – could be used for sleeping bags, couch covers, comforters and other large items. Look for their coupon on the web site www.MontrealLaundromat.com which changes every few weeks. Lavoir Patricia and Lavoir Victoria aim to take the stress out of laundry day. 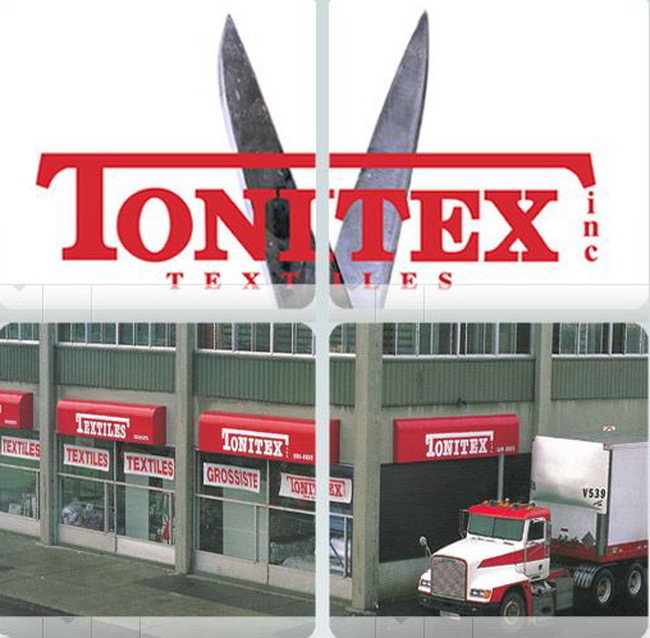 If you are planning an artsy craftsy project or some home re-decorating, you can find your answers at Tonitex, where they sell polar fleece, denim, fake fur, plush, cotton prints, nylon, jogging fleece, broadcloth, lycra, flannel, cotton twills and outerwear fabric to the nearby manufacturers and to you too. Around for over 30 years, you will always find a lot of printed cotton sheeting from top brands like Spectrix, Michael Miller, Baum, Andover, Fabri-quilt and many more brands at discount prices. The huge space is filled to the ceiling with giant fabric rolls accessed by ladders. Look for the coupon bins sold by the kilo – when buying remnants you can save even more money. Ladies, you are in for a treat. 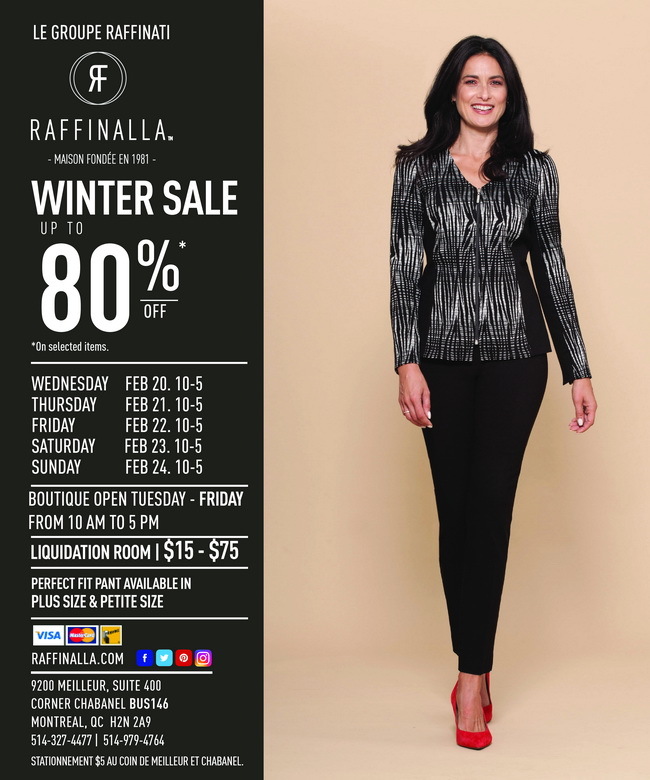 Raffinalla, the well-known, well-made Montreal label is having their winter sale. Raffinalla is the go-to brand for women’s well-tailored, contemporary sportswear with a city-cool vibe. 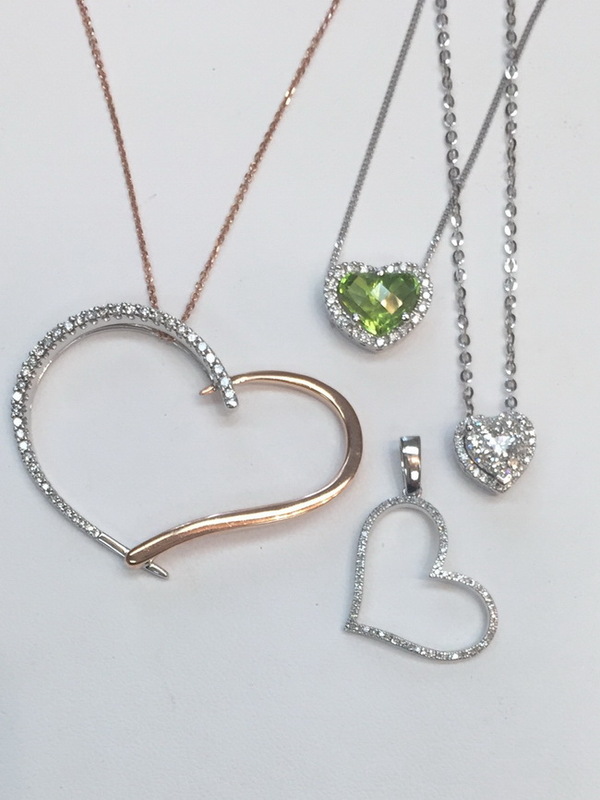 You can find plus sizes 14W – 24W as well as petite sizes 0 – 14, there’s something for everyone. Sleek, sophisticated women’s fashion made from the most luxurious fabrics can be yours. Snag angora wool coats, jackets, selected sportswear, pants – including Perfect Fit Pant, Comfort Fit Leggings, skirts, tops, capes, coats, belts, scarves. You can’t miss with discounts of up to 80% off* on a wide selection of women’s apparel samples and overstock (all sizes available). Perfect Fit Pant starting at $25, tops $15, skirts $25, jackets $35, quilted coats $75, scarves $25, belts $5. Discover for yourself Raffinalla’s fashionable, well-crafted and timeless pieces. Raffinalla worn anywhere, anytime by every generation. Private appointments welcome. Now, while you are stuck inside, you start to dream about how you might reno your home. Should you change the floor? the fabric? the blinds? If you really want to go ahead with this and it’s too overwhelming a thought, help is at hand. You can even put your feet up and call for their free shop-at-home service. Tapis Decor Chantilly has been open since 1983, offering one-stop decor shopping for both home and office, in one location, at competitive prices. You can sit back and let their in-house designers walk you through every step, or feel free to go in with your own ideas or your own designer. For flooring, they sell the gamut from carpets to laminate floors, solid hardwood to engineered wood, linoleum and marmoleum, as well as PVC strip wood and tiles. They also carry a huge array of window coverings from well-know manufacturers, custom-made drapes and bedding, wall coverings, ceramics and more. They supply and install all of their products; their installers are certified and experienced, and they are RBQ licensed. – Fabric: They carry Robert Allen, Kravet, Joanne, Rosedale, Avant-garde and more, in silks, satins, velvets, chenilles, leathers or other types of fabric. They employ their own seamstresses and upholsterers to create decorative valences, headboards, draperies or other ideas you may have. 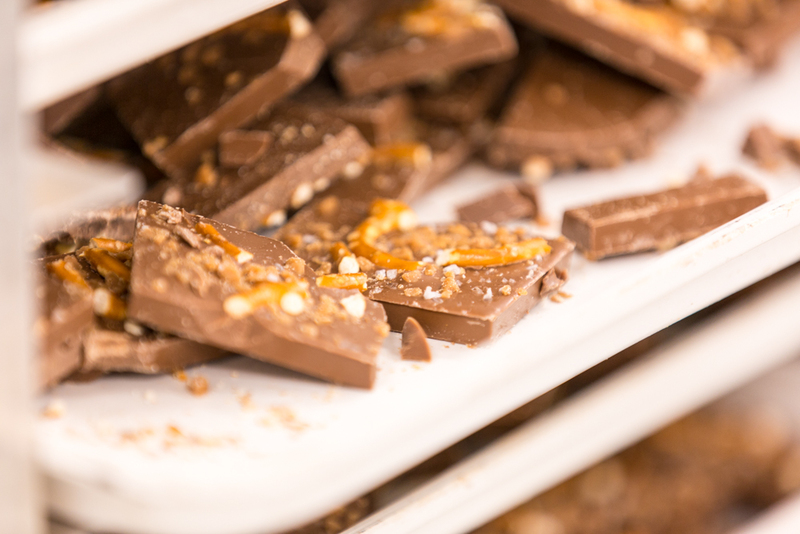 It makes life very easy when you can choose all your products in one place. Location: 707 Lucerne Rd., T.M.R. Wouldn’t it be nice if you could have the bulky boxes of diapers appear on your doorstep every month instead of having to carry them home from the store – and save money at the same time? Mon Petit Monde (also known as Diaper Warehouse or L’Entrepöt des Couches), a friendly local service delivers disposable diapers for babies and adults. Established in 1999, they service individual households, elderly care residences, daycares and associations with a vast choice of products and qualities to accommodate all needs and budgets. Their adult incontinence product line is available in all sizes and absorbencies. It features ATTENDS protective garments, briefs and pads. To ensure optimal pricing, all deliveries are a minimum of 1 case (usually 3 to 4 bags). For the wee ones, there are always Pampers in newborn and size one, and quality generic ones in larger sizes right up to pull ups. They sell diapers for preemies and wipes, too. 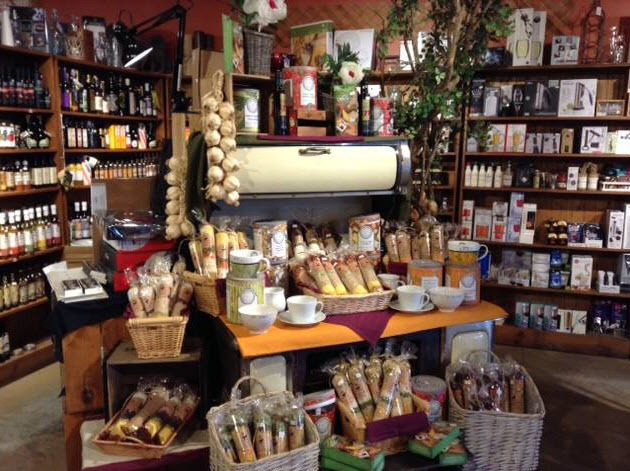 Mon Petit Monde a local family business offers “a hands on” owner’s touch that is rarely seen in today’s big box store economy.